Since school started, my kids have been waking up early. They are up and ready to roll usually about 5:30 a.m. The baby, Wade, is the one that gets the morning going. He can now climb out of his crib and the world is his oyster now. He is so damn excited that he can climb out, he wakes up literally clapping. Doesn't he look like trouble? But cute trouble. It is hard to be too grumpy or groggy when a cute baby comes in your room clapping, so excited to start the day. I started a strict one tv show rule before breakfast policy. And the show cannot be on Nickelodeon, Cartoon Network or ESPN. The kids are only allowed to watch nice, calm shows like "The Berenstein Bears" and "Arthur." My older two, who are the very sophisticated ages of 7 and 9, think this rule is ridiculous. "Believe in yourself that's the place to start. And I say hey, what a wonderful kind of day, where we can work and play and get along with each other." --doesn't get much better than that message! But they are nicer, calmer people when they start the day out with a sweet positive message about sharing and caring. In fact I think we all would be. I remember when my oldest, Peyton, was a baby and I worked full-time, we had a morning tv ritual that was quite calming. We watched "Bear in the Big Blue House" on Disney Channel. I promise you, my days were always better after that very positive Bear solved the problem in the house than the days when I watched the world's problems on "The Today Show." There has to be a study somewhere, but I am not going to look it up because I don't really need to do that. My informal study is my household of crazy, loud, over-stimulated, screen-loving...people. I was going to say kids, but as I was typing the description, it sounded like me too. It isn't even just television, kids' books make people nicer too. 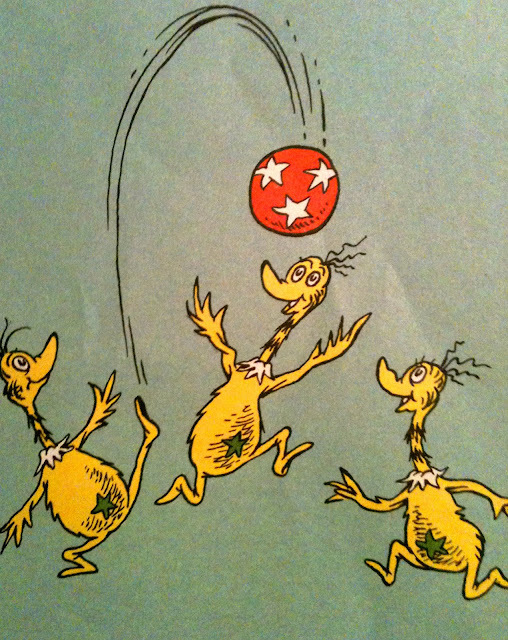 While reading my favorite Dr. Seuss book, "The Sneetches," to JT, he said "Geez all this guy cares about is money, can you believe that? Phew, we don't know him." The innocence, the sweetness melts my heart. "I know, phew is right," I told him like we were equals. Like I wasn't a grumpy old adult who had forgotten all the sweet, happy messages of childhood. So here is my really wise advice....feeling stressed? Pick up a copy of "The Sneetches" or watch an episode of "Arthur." Kids aren't home or you don't even have kids? What the hell, do it anyway. I promise you will feel happier, calmer and be nicer to people.